From the Daily Telegraph August 9th 2008 – Updated March 5th 2010. 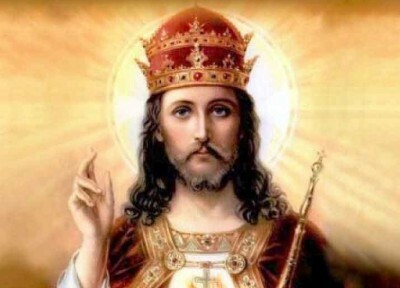 Level 5 Coach Jesus H. Christ demonstrates the correct finger position for bowling inswingers. Jesus Christ was indeed a fine cricket player, elegant for a man less than five feet tall, and gracious in his many defeats. Christ was widely loved by early students of the summer game, his ability to feed 5000 people with a few loaves of bread and a couple of fishes came in particularly useful during those interminable Headingly lunch-breaks. As indeed did his ability to walk on water during games at New Road, Worcester in early spring. Though it must be said that he was not so much loved by cricket journalists who regularly crucified him in the ‘Red Top’ stone tablets of the day. The Palestinian team (or ‘The Isrealites’ as they were known to their fanatical fan-base) had a very strained relationship with the media and the cricketing and political authorities of the day. It was this negative attitude to those in authority that would eventually lead to Christ’s downfall. The baby Jesus was first drawn to cricket through his dad, Joe, who was chief supplier of jock-straps and thigh-pads to Bethlehem C.C. He trained as a carpenter, and was able to supply his dad with a series of innovative wooden cricket products, his ‘Self-Reassembling Wickets’ were considered the wonder of the age..
Christ was an inventive cricketer, here we see him modeling his early prototype cricket helmet. However his patented Cross design for his excpetionally heavy ‘Crucifix’ model bat, was a commercial flop. Players found it too difficult to manoever the ball around the infield with a bat weighing close to 300 pounds. Although when they did manage to middle it – Wow! Such was Christ’s promise and prodigious skills that he was promoted to Captain of Bethlehem CC Firsts at a very early age (3), though it would be a few years before he first came to national attention with a useful knock of 723 against ‘The Good Gentlemen of Gallilee’. However, given that the Galilleean selectors had been able to locate no more than seven gentlemen, this score was later expunged from the 19 a.d. edition of Wisden. Christ went on to Captain Palestine through their most successful period ever (a.d. 23 to 31). It’s often said that a cricket team is better off with a lucky captain than a good one, and for all his evident skills it must be said that Christ was a quite extraordinarily lucky captain. Once, at lunch on the fifth day of a test match against a strong Pharasese 11, the Israelites were 213 for nine chasing a total of 645, when the match was abandoned after the square was hit by a mysterious plague of frogs. The end came for Christ rather predictably after he offended the authorities for the umpteenth time, due to an incident with off-spinner Lazarus on the road to Damascus C.C.’s ground. Local M.C.C. representative Pontius Pilate finally lost patience and sentenced Christ to death citing Law 17 paragraph 2 subsection 3 “Thou shalt not use the M.C.C.’s name in vain, or seek to cause grief, strife or Acid Indigestion to M.C.C. muckety-mucks”. Sadly it must be noted that the “evidence” for Christ’s “crimes” – such as they were, was provided by wicket keeper Judas Iscariot, who wrote a three page affidavit in return (it is alleged) for a year’s supply of jock-straps and linseed oil. The execution was carried out by a touring Roman team on a rest day between matches, in a cruel twist, they executed Christ by nailing him to one of his own ‘Crucifix’ model super-heavy cricket bats. Christ, J. (Arisen) L.B.W. Bowled Mohammed (PBOH) 19. What’s odd here is that this is a record of a match that took place fully 19 days AFTER Christ’s execution. What could this mean? What does Arisen mean? There was much speculation until a contemporary match report was found by scholars in the Nazareth Gazette & Chronicle, this confirmed that indeed, a “noticeably pale and sick looking” Jesus did return for this game dressed only in a muslin shroud. Much to the amazement of his team mates. The report notes that Christ “looked out of form” and “unsteady on his feet”. Upon being given out L.B.W. by Umpire Gabriel, Christ apparently went berserk claiming that the ball was missing leg stump by some distance, before storming off never to be seen again. His shroud was found on the square leg boundary and given as a gift to the Captain of Turin C.C. who were playing on an adjacent field. Quite what his batting average is up there, we can only imagine!